When you find that you are in need of a new furnace, think of Amana. 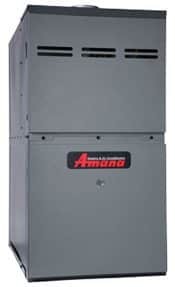 Known for providing long-lasting service, you can’t go wrong with an Amana furnace. For the best location to purchase your new furnace or even have your existing one serviced, turn to Jennings for all your Amana furnace service and sales needs. At Amana, you’ll find that the innovation they have always been known for in their home appliances makes its way to their furnaces. In fact, being known as delivering the highest quality product in the industry is always job one. One aspect of what makes a product stand out from the crowd is longevity. A long-lasting product will reduce your costs over time and keep your family warm and comfortable as well as providing a stress-free environment. Amana’s innovative manufacturing processes and top-notch craftsmanship ensure you receive the best product possible. In addition, they apply an incredibly rigorous quality assurance process to each and every furnace before it leaves their manufacturing center. At Jennings, our technicians are NATE certified. This means they can help you determine whether your furnace simply needs serviced or if a new unit is called for. We are available 24 hours a day, 7 days a week, and 365 days a year. Contact us today to schedule an appointment!